This drive will astonish you with some of the most magnificent scenery Australia has to offer. It will seem like every day takes you through a different world, from the swoops and bends of the Great Ocean Road to the historic gold rush opulence of Bendigo. Your first night is spent in Apollo Bay, a quaint fishing village from which you can explore other nearby coastal hamlets. Then continue up the coast, stopping on the way to witness the splendour of the 12 Apostles, the infamous limestone structures that have formed from the chalky cliffs of the Shipwreck Coast. Spare a thought for the 700 or so vessels that are said to have met their fate in these treacherous waters. After a night in Port Fairy turn inland and north, heading towards the heart stirring views of the Grampians and the welcoming atmosphere of Halls Gap, a special little town in the mountains that you will not want to leave. A day and a night exploring the lush scenery of the Grampians and then it is time to strike out for the gold town, Bendigo. Originally a base for miners in the rush of the 1850's, the Victorian architecture acknowledges Bendigo's rich history, and you will enjoy sampling its treasures new and old before you head back to Melbourne. Day 1: Melbourne to Apollo Bay. This 194 kilometre drive will take about two to three hours because of the winding nature of the road. Head west from Melbourne along the West Gate and Princes freeways and follow the signs to the Great Ocean Road. This drive takes you through Torquay, the surfing capital of Australia and home of the renowned Bells Beach, where the annual Rip Curl Pro surfing challenge is held. Stop in and and stock up on some cheap board shorts and bikinis at the many surf factory shops in the town. This first section of the Great Ocean Road is touted as the most beautiful, with the 42 kilometre section between Lorne and Apollo Bay noted as being strikingly special. Apollo Bay is situated at the base of the Otway ranges, and can be used as a base to explore their walking trails and lookouts. It also has a long and safe swimming beach that is popular amongst surfers. The ultimate harbour experience! The main income of this town comes from fishing, and visitors can take a stroll through its wharves and check out the large fishing fleet. Fresh fish and lobsters are available from the fishermen coming in with their catch. The Waterfalls of the Otways. The Otways are home to many waterfalls that cascade down into the dense green vegetation from great heights. A bush walk topped off with a swim at their base will be rewarding and refreshing. Day 2: Apollo Bay to Port Fairy. This 192 kilometre drive will take about three hours if you do it in one hit, and brings you to the end of your drive on the Great Ocean Road. You would be foolish not to stop at the Twelve Apostles and take in their impressive limestone formation, said to be over 20 million years old. Like giant stalagmites these lonely pillars rise from the swells of the ocean, seperated from the cliffs that have been eroded back. Whilst only seven remain standing, the bases of collapsed rock where the rest stood are still visible. Then on to Port Fairy, a busy fishing port that was one of the state's earliest settled villages. Over 50 nineteenth century buildings in the Port are classified by the national trust, and history and architecture enthusiasts are able to visit these. The Twelve Apostles and their associated limestone features such as London Bridge are the must-see attractions on this drive. If you have time why not give Wreck Beach a look, which is near the Twelve Apostles and is the eastern point of the Shipwreck Coast, a 130 kilometre stretch of dangerous water that has claimed many a sailors lives. Wreck Beach is littered with the ancient remains of two ships that met their fate towards the end of the nineteenth century. If the season is right you may be lucky enough to spot the majestic humpback whale surfacing off Logans Beach, near Port Fairy. Authorities have built viewing platforms and there are also whale watching charter cruises available. Big 4 Anchorage Holiday Park. Day 3: Port Fairy to Halls Gap. Turning North away from the Great Ocean Road, this drive is 158 kilometres and will take you about two and a half hours. The rugged scenery of the Grampian Mountains greets you as you near Halls Gap, which with only 300 residents is the tiny tourist hub of the Grampian National Park. This Park is famed for its wide range of outdoor activities, its beautiful views and its heart stirring rock formations. So if you are feeling active you can choose from rock climbing, fishing, bush walking, canoeing, cycling and many more pastimes. If its relaxation you are after then just lie back and take in the awe inspiring views, or take a wander and look for some of the cheerful wildflowers that abound on the mountain slopes. Stop in at Dunkeld, a small township as you enter the Grampians. This historical town was first established in the 1830's, and since then has only grown slightly to a size of 450 residents. Over the years it has been home to many artists such as Nicholas Chevalier, who came to paint their impressions of the region. Historic and quaint, this town deserves at least a couple of hours of your time. The mountains have been inhabited by indigenous Australians for nearly 500 years, and contain the majority of the Aboriginal rock art in south-east Australia. The local indigenous communities are willing and happy to share this part of their heritage with visitors to the region. Serenity on High offers self contained homes that can be booked out for any length of time, from a single night to as long as you please. The magnificent bush setting is within walking distance of Halls Gap, and is perfect for families. (www.stayz.com.au/7117). Day 4: Halls Gap to Bendigo. This easy drive will take you about two and a half hours to complete its 206 kilometres. 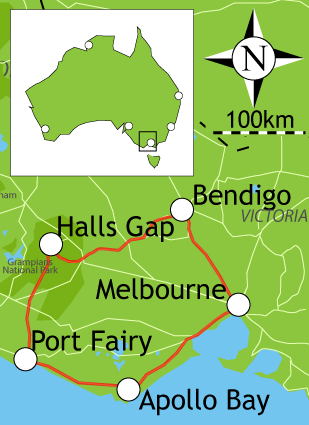 Get onto the Pyrenees Highway and turn north at Castlemaine to reach Bendigo. Take it slow through the remainder of the Grampians from Halls Gap, enjoying the jagged mountainous scenery for a last time. The country you drive through is far from flat however, as you traverse in and around the Great Dividing Range. Lush farmlands and wineries greet you as Bendigo and its surrounding Goldfields get closer. Bendigo is a historically significant town, rising out of the gold rush of over 150 years ago. Lavish Victorian architecture is sure to enchant you, and although the gold rush is over Bendigo is brimming over with other riches in the guise of its arts, culture, food, wine and heritage. Robinley Caravan Park offers cabins, caravans and powered camping sites. Its a family owned complex that has clean and modern amenities. Tap into the local knowledge of the owners and use this as an affordable base to explore Bendigo from. This short drive of 146 kilometres will take you under two hours, so an early start will give you ample to time to explore the wonders of the big city. The drive itself is an easy run down the Calder freeway, and with a busy day ahead of you experiencing the cultural buzz that Melbourne is renowned for that is as much a drive as you need. The tricky thing about visiting Melbourne is figuring out where to start! You could fill weeks with sight seeing and still not see everything, so you will probably want to spend more than a day in this city. Melbourne is the cultural hub of Australia, and the numerous art galleries and museums are testament to this. The people of Melbourne are also sports mad, and many of the nations great sporting events are held here. World famous stadiums such as the Melbourne Cricket Ground and the Rod Laver tennis arena host world class sporting events, and on non-event days guided tours will inform and entertain you. Big 4 Dandenong Tourist Park. Return your campervan and start working on that scrapbook!